The team at Pets in Practise provide professional help to resolve your pet’s problem behaviour and offer dog training in Berkshire and the surrounding area. Pets in Practise offers behaviour consultations for cats and dogs, training workshops, behaviour talks and 1-2-1 dog / puppy training. Pull on the lead or fail to come when called? Jump up on greeting or excessively bark? Act destructively in the home or soil indoors? Dig holes and destroy gardens? Show aggression to people or other dogs? Chase cars, children, cats or horses? Show aggression to other cats? Eliminate or scent mark indoors? Not use the litter tray? Keep you awake at night? Are you looking for a qualified and fully accredited pet behaviourist or dog trainer to help with your pet's problem behaviour or improve their training? If yes, click here to read this article so you can ensure you get the best possible behavioural help you and your pet deserve and then call the professionals in! Nicole has a BSc (Hons) Degree in Applied Animal Behaviour via Portsmouth University. She has been a qualified and registered Veterinary Nurse for nearly twenty years, provided puppy socialisation classes for twelve years and over the past five years gained an ESPVS Nurse Certificate in Animal Behaviour and a COAPE Diploma in the Practical Aspects of Companion Animal Training and Behaviour. The combination of a behaviour degree, her veterinary nursing background and owning a dog with severe behavioural issues ensures Nicole is well equipped to deal with all feline and canine behaviour problems. With such a highly qualified pet behaviour counsellor you can be guaranteed a first class professional service from Pets in Practise. 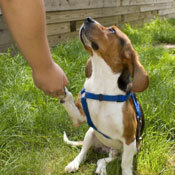 Please contact us at Pets in Practise via our contact page if you would like more details.